Yeah Hot Mess is an extremely soft minimalist apparel designed by Gina from New York City. Her designs range from a variety of shirts and tank tops with messages or artwork. They come in a lot of colors to suit your taste. I personally love this tank top that says C'est La Vie! The tank top is so comfy and I would love to wear it for my summer outdoor activities. Since it's fall now, I styled it in a more fall appropriate look because I love it so much and I want to be able to wear it any time of the year! 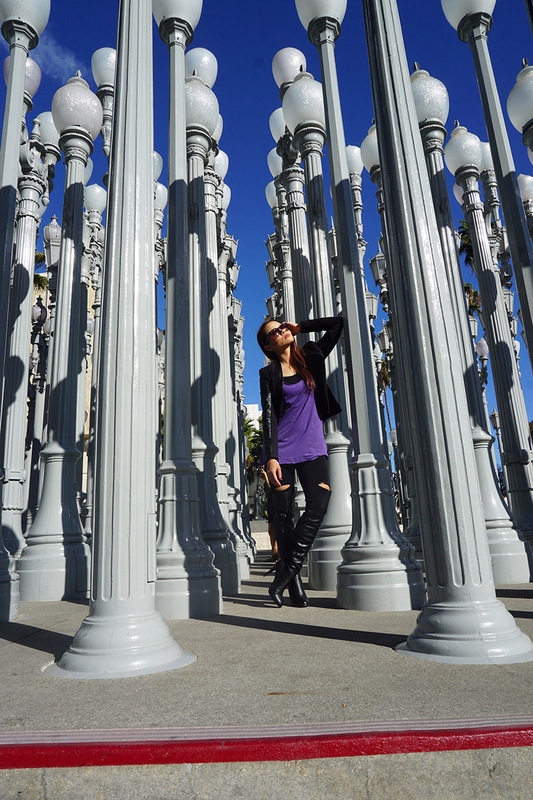 I went to my favorite spot in LA, the Urban Light at LACMA and the purple tank top looked so good against the lamps! I think the top looks great even in an Autumn outfit... The designs are so minimalist and versatile for any look! Shop your Yeah Hot mess shirts at www.yeahotmess.com... so many designs to choose from! Your outfit is beautiful.. Love the leather jacket.. Always wanted to visit this place! great photos! Love the purple---and that backdrop!! Cute photos! Love your outfit and the background. This place is so awesome. Love your outfit. Have a great week ahead. Cool pictures, love the blazer! You chose a perfect location for these outfit photos. Such an amazing look! I love the location! I Love this outfit, simple and fun. You look Chic as always. Loving this edgy look on you, girlie; you look so good in purple! Gorgeous pics. You look stunning. This is so beautiful.The purple looks amazing on you. What a cool location! Love this edgy look. Such a dreamy location for a shoot! Always wanted to visit this place! Your photos are so good! Thank you for sharing!! What a cool location for a photoshooting!!! fun photo location! super cool fall style! so flawless in both outfits!